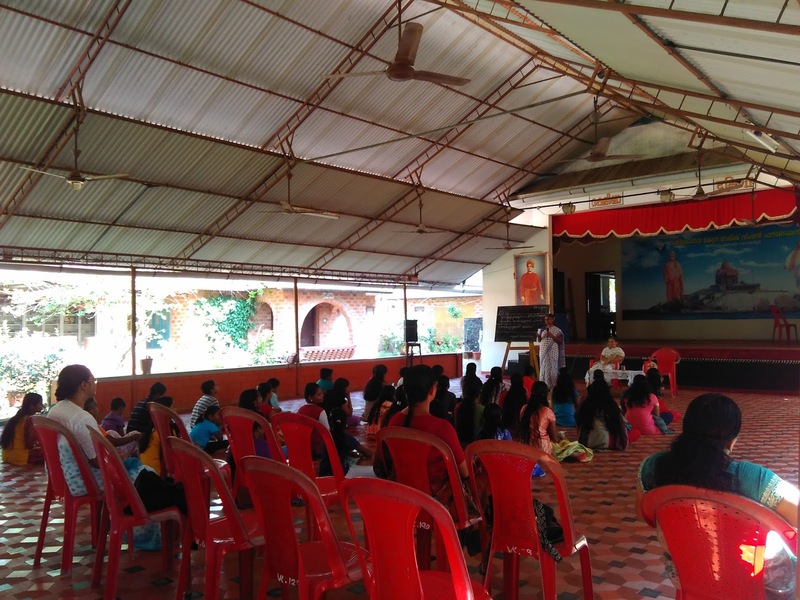 The first of the 2 camps for the year 2016-17, was held at Sri Ramakrishna Ashrama, Palemad, Nilambur. 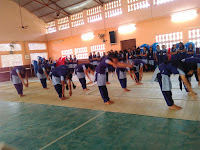 The Asrama is headed by Swami Atmaswarupananda. On 24th December the SKIE participants(one from class VIII and seven from class IX) along with four elders (three of them from SKIE team and a well-wisher) as their escorts had an exciting journey by the early morning train to Nilambur from Thrissur station. For some of the children, it was the first time that they were traveling by an ordinary passenger train. During the train journey, one came across many an old multistoried thatched house, a rare spectacle in the modern town, impressions which would be everlasting in the mind of these city children. At Nilambur Road(Railway Station) by around 1:30 pm and were overjoyed to meet Swami Atmaswarupanandaji who had come down to the Nilambur station to receive them. Post this everyone retired for some time to freshen up for the Sandhya Bhajan. The Ashrama and its surroundings reverberated to the Omkara, kirtans, and chantings. Soon it was time for dinner and we were served with a sumptuous meal. 25th morning after Prarthana and yoga, it was time for a short walk and exploration. The experience of walking on a log bridge; Climbing up this small hillock, in the cool hours of the morning, to have a sneak peek of the sunrise. It was time to move out to explore Nilambur. The first stop was Aruvakode, a small village situated close to Nilambur. Known for its fine pottery carried out by a traditional community named Kumbharan. The advent of globalization has literally killed this art form and it is Artist K.B Jinan who initiated the Kumbham Handicraft Project to revive the art form and save the people from the clutches of poverty. It is also said that the artisans originally belonged to Andhra Pradesh, and were provided land by the then rulers of the Nilambur Kovilakam. A visit to Nilambur cannot be complete without the visit to Conolly's Plot. Named after H. V. Conolly, the British Malabar district collector, who was instrumental in the systematic planting of teak there. However it was Chathu Menon, a forest officer, who organized the planting of the saplings, and as like all other things the creator/inventor always remain obscured....nature is the best example. 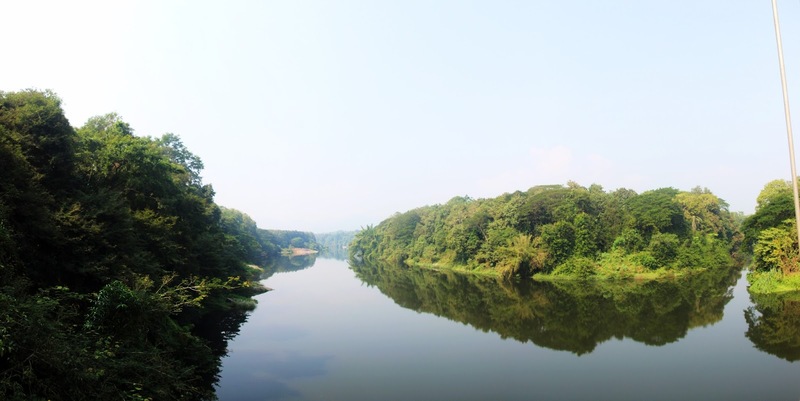 The initial plantation was about 1500 acres, of this abut 9.1 acres of teak were chopped off to meet the requirements of the allies in World War II.The two sides of the plot are bordered by the rivers Chaliyar and Kurinjipuzha, the other two sides by the dense forests of Kerala. Kurinjipuzha supposedly has the purest water in the region in all the seasons, it merges with the Chaliyar at the corner of the Conolly's plot. Nilambur Kovilakam, the seat of erstwhile Nilambur rulers was the next stop. A visit to the teak museum, Nilambur was next on the card. The children had a surprise visit from Sri Mahadev an avid traveller, Photographer and Managing Trustee of Sukritham Girls Home, Kozhikode. He was accompanied by Sri Manoharan. Sri Mahadev introduced "Sukritham" and then transported each of us on a mystical journey to Shrikhand Mahadev and Kinner Kailash with his photo presentation. 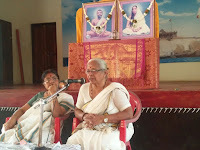 On 26th morning after prathah smaran, yoga and breakfast we visited Karakkode Kavu and Sri Ramananda Asramam. 'Kavu' means sacred grove.The 'Kavu' is very unique to Kerala and is generally a self-sustaining ecosystem. It is believed that Parasurama the great sage had his penance in this area. The ancient Devi temple of Goddess Vana Durga represents the vision received by the sage from his penance. To bicker down a valley. ....' "The Brook - Poem by Alfred Lord Tennyson"
Post the visit to the Kavu, it was trekking time, walking along NH28 towards the Tamil Nadu border. The high energy of the children and group inspired the driver of our vehicle to join the trek..... And we keep blaming that children are always glued to TV and mobiles. Finally after a long walk we reached the border. Back at Sri Ramakrishna Ashrama, Palemad, had a delicious lunch prepared by Narayanan Chetan. A short rest and it was time for krida. Swami Atmaswarupananda, who heads the Sri Ramakrishna Ashrama, at Palemad, Nilambur to whom we are so grateful to, to accommodate us. The interactions with Swamiji were highly knowledge gaining and thought provoking for each of us in its own ways...In the front row, the first person from the left is Sri Narayanan Chetan, the person behind the hunger needs of all of us. The food was absolutely mouth watering and a big namaskar to him for managing the kitchen single-handedly. He even packed lunch for us to have on the train on the way back. 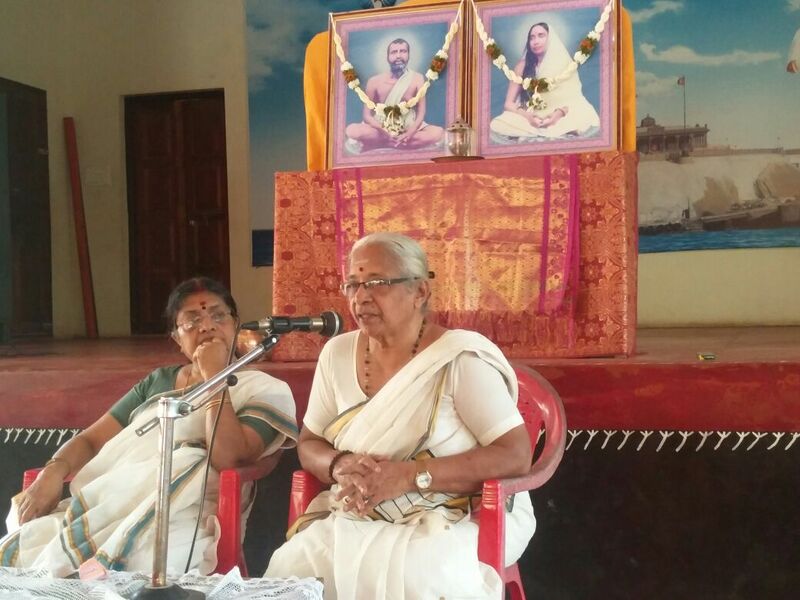 Samskara varg Prashikshan Shibir was conducted from 29th to 31st December. Out of total 30 participants, one was from Thiruvananthapuram and the rest were from in and around Kodungallur. Three student resource persons and karyakartas of Madurai centre, Sri Braghaspathi, Arun and Karthik came with Sushree Sumitra didi, all the way from Madurai to train the children. Sushree Chaitanya, nivasi karyakarta from Thiruvananthapuram came to train the children in Science and Mathematics models. Pranta Sanghatak, Sushree Radha Didi, along with Adaraneya Lalita Didi too were present to give overall guidance to the trainers. 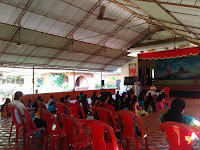 Apart from 8 participants out of 10 from Kodungallur who were present in the previous Prashikshan Shibir held in the month of April 2016, the rest were all new. The routine was from 9 am. in the morning to 5 pm in the evening. 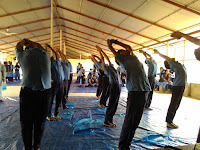 Within the three days, participants learned a lot of Sanskrit slokas, games, Suryanamaskar, slogans, commands and songs. They were also introduced to drama performance based on the stories on the life and message of Swami Vivekananda. The Science experiments based on surface tension, eye coordination etc and Maths models based on Geometry, were eye-openers for many of them. On the concluding day, all of them promised to increase the number of members in their already existing Vargas, and also start new ones in their locality. But for the guidance and active teamwork of all those who have been in the organizing team, the Shibir would not have been successful. In the concluding programme Man Lakshmi Didi and Radha didi chaired the session. In her address, Sushree Radha didi highlighted the salient features of the camp and Man Didi told the children how values are important in their lives. Sandeepani Sishuvihar children celebrate Holy Mothers Jayanthi as Matrupuja day. This year it was celebrated on this auspicious Kalpatharu day, January 1st, All the Sandeepani Sishuvihar children and other neighboring children. with their parents assembled in Dakshina hall of Ananda Dham. Man. Lakshmi Didi highlighted the significance of Matru Puja and Kalpatharu Divas. Later on, she guided the children to perform the Matru Puja in an orderly way. The hall was filled with the chantings of mantras and prayers. The joy and prayerful mood which children and mothers have experienced were visible in their faces and actions. The programme concluded with Shanti mantra. 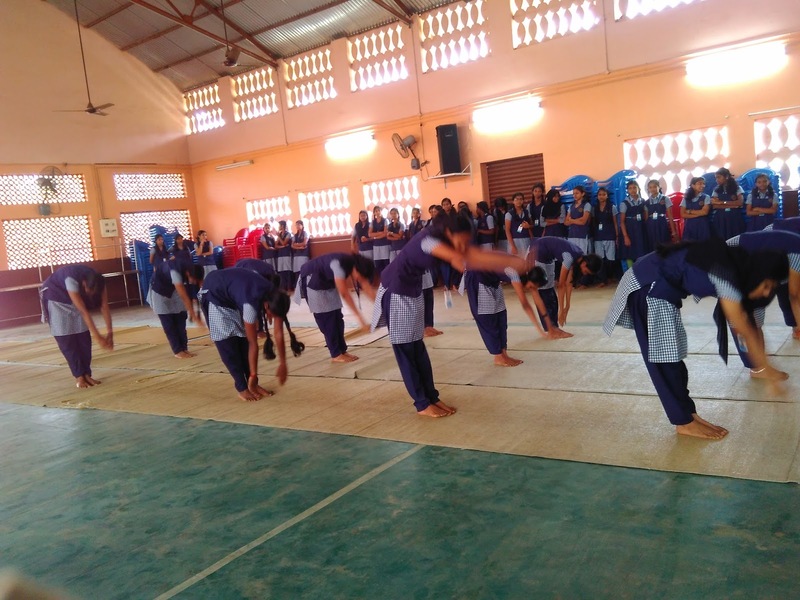 Surya Namaskar competitions were conducted for the students of classes VI to X, in 5 schools from 4th January to 14th January.420 students participated in groups of 12 at schools. From each of the schools a group of boys and a group of girls were selected and on 20th January the final Surya Kiran competition was held where five groups of girls and 5 groups of boys totalling 120 selected students took part in the competition.Among the boys , Bharatiya Vidya Bhavan, Irinjalakuda got the first position and among the girls, Gurushree Public School girls were the winners. All the 420 participants received a book on Swamiji's life and message. Group Competitions for Patriotic and Folk songs in the U.P. and Higher Secondary levels were held on 20th and 21st January. 7 schools in both the group songs, and a total of 150 students participated.